Say hello to our favorite granola evahhhh! Crunchy chocolate spiked oats are kissed with peppermint and pecans for a tasty treat! Pre-heat oven to 300 degrees F and move the center rack up a level. In a large bowl, whisk together maple syrup, coconut oil, brown sugar, cocoa powder, vanilla and salt. Add your oats and almonds, using a rubber spatula to fold the mixture together. Once the oats are coated with chocolatey deliciousness, use your spatula to pour the granola onto your parchment-paper lined baking pan. If you want large chunks of granola (the best!) fatten the mixture into an even layer with your spatula, adding pressure so the granola is nice and compact. Layer it so that you can't see any parchment paper under the granola. Bake for 20 minutes, rotate the pan for even toasting, then bake for an additional 20 minutes. Bake time will be 40 minutes total. Once you remove your granola from the oven, top with 3/4 cup dark chocolate chips (I won't tell if you go cuckoo for cocoa puffs and add more) and chopped pecans while it's still hot. Hookay! Back to the granola! This is where you fight the urge to scoop the still-warm granola up with your hands and deliver it to your face by the fistful. Partaking in the glory that is warm melted chocolate and crispy, nutty granola. Well.....a spoonful or two won't hurt right? Just save some for later! Allow the granola to cool on the baking sheet for an hour or two. Combine white chocolate and coconut oil in a glass dish (I used my lipped measuring cup, perfect for pouring!) and heat for 30 seconds, stir, then heat for an additional 30 seconds. Repeat if needed, taking care not to overheat the chocolate. 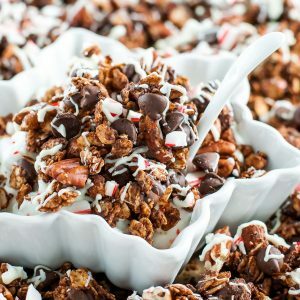 Drizzle granola with melted white chocolate and top with crushed candy cane. Steal some to snack on, then allow the rest to cool for a few hours or overnight, covering the baking sheet with foil to keep it fresh. Transfer into jars for gifting, add to baggies to pack in your holiday cookie tins, or simply store in an airtight container for all your snacking needs. Granola can typically be stored at room temperature for up to 2 weeks! To ensure this granola is gloriously gluten-free, simply check the label on your oats to make sure they're GF certified.Because they're so tender and buttery on their own, I like my pecans straight up, which is why they're not roasted along with the almonds and instead added along with the chocolate chips.